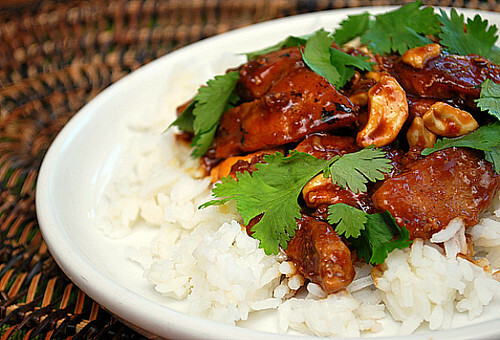 Stir Fried Cashew Pork is definitely a Chinese American dish that's popular in our house. After browning and sauteeing the pork, garlic and ginger is added to the skillet for the base of aromatics. For the sauce, a mixture of hoisin sauce, water, soy sauce and red pepper flakes are added along with the cashews. The sauce eventually thickens while it deglazes the bottom of the skillet. Before you know it, the dish is done and garnished with fresh cilantro leaves for that added pop of color and bright flavor. Served over steamed rice or even your choice of noodles, this is one dish that may make you rethink having Chinese food delivered! Combine the hoisin sauce, water, soy sauce, and pepper flakes in 1 liquid measuring cup. Heat a few teaspoons of the oil in a large nonstick skillet (or cast iron skillet) over medium high heat until it just starts to smoke. Brown and saute the pork in the skillet and push out to the sides of the pan when done. Add the remaining oil to the skillet and add the garlic and ginger. Cook the garlic and ginger for a few seconds until fragrant. Pull the pork back to the center of the skillet and add the cashews and hoisin mixture. Cook until the sauce has thickened and remove off heat. Sprinkle with cilantro and serve with steamed rice. This sounds absolutely fantastic! I make a similar dish with tofu and sometimes chicken although mine has more of a Vietnamese flare. I wish I was as good as you when it comes to NOT ordering chinese takeout, but sometimes I love the laziness and their delicious fake meats. Joelen, about how many does this serve? I made this last night, and it was delicious! I made it with two thin pork chops (I halved the recipe) and it fed me and my husband. I combined it with lo mein and steamed green beans - so good! Ok. It's official. I want to make everything on your blog :P shall be printing quite a few pages now!